The Wildernets firmware targets only the MP02 and MP02-Phone models. When I started this project (over 2 years ago), I was trying to develop it for the MP01 and the same TP-Link devices for which we were developing SECN firmware. While working on the development of SECN 1.1, the only way we could get Asterisk to run on the TP-Link devices was to create an extension filesystem on USB. Getting Asterisk to run on a path other than the one compiled in was a pain. I repeated that exercise with Prosody IM a while after that and was never happy with how awkward it was. I think that model can work with the tech savvy VillageTelco operators but while trying to develop firmware that would be dead easy for less experienced users, I concluded that the USB extension filesystem (and variants like pivot-root and overlay-root) were non-starters from a support point of view. I also needed more memory than the typical TP-Link devices offer. When the MP02 arrived, I finally had what I needed in terms of memory, storage, and network interfaces to achieve the goals I had set for the Wildernets project. Mode 1 (All-in-one mode): This is the default, out-of-the box mode. This mode is typically only used if you have just a single MP02. All of the above described services are running. Mode 2: In this mode, the MP02 runs all services except for the Prosody IM service. This is the mode you would set on one MP02 if you have created a two node Wildernets network. Your second node would run Mode 4 as described below. Mode 3: In this mode, the MP02 runs all services except Prosody IM and the Web content server. This is the mode you would set on one MP02 if you have created a Wildernets network consisting of three or more nodes. One of your additional nodes would run Mode 4 and another additional node would run Mode 5. Any additional nodes beyond the first three would run Mode 0 (see below). Mode 4: In this mode, the MP02 only runs the Prosody IM service. It will also run Asterisk automatically but only if the MP02 is a MP02-Phone model. Mode 5: In this mode, the MP02 only runs the Web content service. As in mode 4, it will also automatically run Asterisk if it is a MP02-Phone model. Mode 0: In this mode, the MP02 runs no services other than providing mesh extension. Again, like modes 4 and 5, it will enable Asterisk automatically if it is a MP02-Phone model. The current mode of the MP02 is signaled via the “World” LED in the MP02. Every three seconds, the LED will blink once, twice, three times, four times, five times, or not at all depending on its mode. So you can always tell at a glance which MP02 is running which mode (note the MP02 animated gifs above). To set the MP02 mode, you simply click the recessed toggle button with a paper clip. Each time you click the button, the mode increments until it reaches 5 and then goes back to 0. Once you have the MP02 displaying the desired mode, just power-cycle it to activate the new mode. That’s all there is to it. The Wildernets firmware includes a new “Global” configuration tab in the WebUI. The upper portion of the page includes a dynamic display showing all of the active nodes in the network. Note that the Wildernets firmware uses DNSMASQ to allow the MP02’s running services to be addressed via host names instead of IP addresses. This simplifies configuration of the user’s softphone and IM client software and allows the owner/administrator to change the IP network address without affecting the client software configuration. The SIP service is provided at address . MP02’s not running services (mode 0), are provided IP addresses via DNSMASQ/DHCP from the MP02 running in mode 1, 2 or 3 (known collectively as “Master mode”). If the user/administrator wants to discover those dynamically assigned IP addresses, the above Global panel can be consulted. If the owner/administrator wants to assign a static IP address to an MP02 with a DHCP-assigned IP address, they can just click on the IP address in the Global panel to go directly to the admin WebUI of that node where the IP address can be changed to the desired static IP address. Alternatively, if that MP02 is a Phone model, the address can be changed using the attached phone via the IVR (2662). 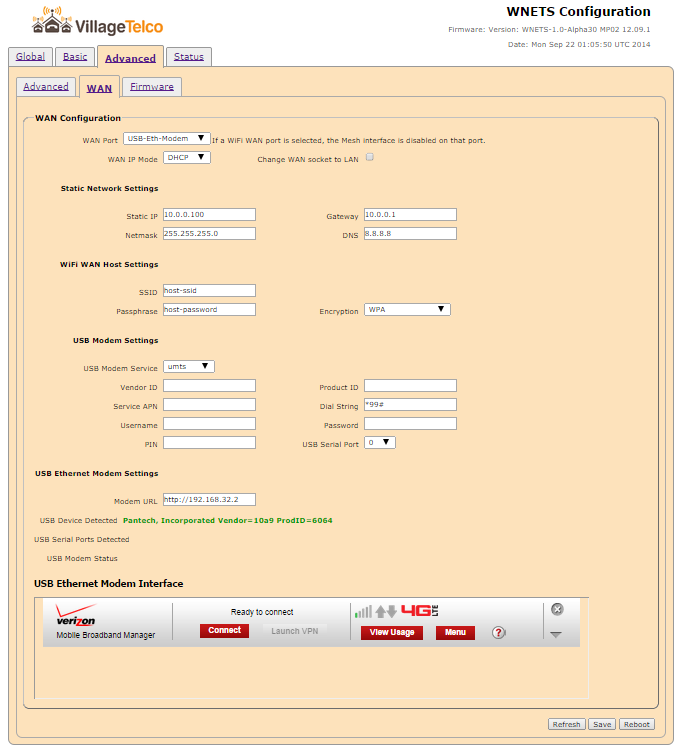 Wildernets also provides a set of Client web pages that provide information about the network, pointers to local Web content, and extensive help with the installation of the recommended SIP and IM client software on their Android, Linux, or Windows client device. The Installation help pages even include local pointers to download the recommended SIP and IM client software already stored on the local Web server. Unlike the Admin Web pages, these pages are intended for the users/guests of the network and aren’t password protected. For the owner/administrator, the SECN WebUI has been enhanced with the Global tab. Besides the panel that dynamically shows all active MP02s, the Global tab also provides the ability to change a number of configuration parameters on all of the MP02s at once. This makes it much easier to secure the network by changing things like the WPA pass key and SSID. This also allows the owner/adminstrator to change the IP network address, the Wifi AP mode and radio channel on all nodes with a single click. In a similar fashion, the Advanced Firmware tab has been enhanced with the addition of the Global firmware upgrade. This allows the owner/administrator to upgrade all of the nodes to a new version of the Wildernets firmware with a single operation. After selecting the desired firmware image, the image is uploaded to the master MP02 and optionally checked against the MD5 checksum. The owner/administrator then just clicks the “Initiate Upgrade” button. An upgrade offer is broadcast to all active nodes. Each node checks that it is not already on that version of firmware and then retrieves the image from the “master” MP02, verifies its checksum, and then upgrades itself using the sysupgrade utility in “preserve configuration” mode. I use this routinely to upgrade the firmware on my test network of seven MP02s. Watching the Global display of active nodes, I have always found that all nodes are reporting the new version in under 15 minutes. One final enhancement to the WAN configuration panel is worth mentioning. Wildernets adds basic support for the newer breed of USB Ethernet Modems popular on 4G networks. These USB modems provide an ethernet over USB interface to the OS. This interface shows up as eth2 and automatically receives an IP address from the USB modem. To connect, disconnect, and get status from the modem, you just need to enter the URL for the modem’s web interface under “USB Ethernet Modem Settings”. As shown below, I simply entered my Pantech UML295’s documented URL of http://192.168.32.2 and the USB Ethernet Modem Interface box provides direct access to the Pantech modem’s web interface. If you have one of these newer style USB modems, I’ll be very interested to know if anything else needs to be added to the above interface to make your modem work. 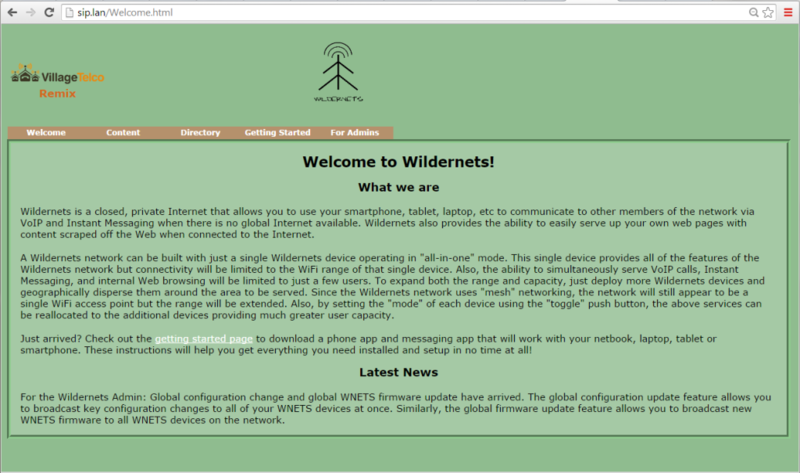 Wildernets is currently at version WNETS 1.0 Alpha30. 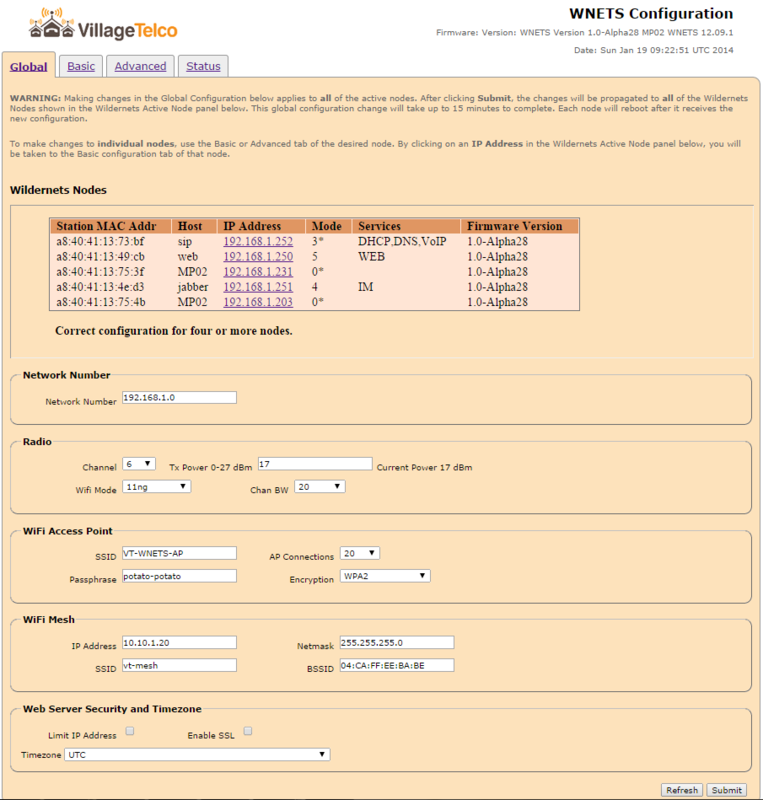 It can be downloaded from the Villagetelco website here. You can easily move back and forth between WNETS 1.0 and SECN 2.X using the Advanced Firmware Local Upgrade mechanism or the “sysupgrade” script. However, you won’t be able to use the “preserve configuration” option when going from one to the other. Also note that the two versions should interoperate as long as you use the same BSSID, SSID, Radio mode and Radio channel.